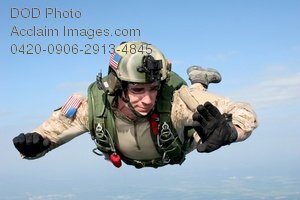 Description: Free, public domain image: Skydiver Freefalling Through the Air. Staff Sgt. Jonathan C. McCoy, selected as one of the 12 Outstanding Airmen of the year, is a pararescueman with the 24th Special Tactics Squadron at Pope AFB, N.C. He is a combat-hardened NCO who spent 2006 performing heroically in operations Enduring Freedom and Iraqi Freedom. Sergeant McCoy deployed as a combat search and rescue team leader and was engaged in life-threatening engagements, earning two Bronze Stars, one with valor. (U.S. Air Force photo.